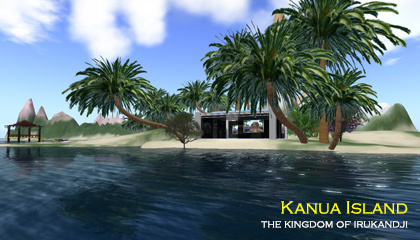 Kanua Island is a residential simulator on the SpotOn3D virtual world. Being a transitional grid, the lifespan of Kanua Island was a short one, approximately three months. Again due to its temporary nature, I used the name Kanua Island instead of Mount Aboyo Island, which is the region that normally occupies the grid square southeast of Tamita Island in central Irukandji. Despite all this however, a lot of work went into terraforming Kanua Island by hand, and I look back on the hill and valley landscape fondly. Kanua Island had two residents for most of its life, including a shop face Iruka Bay to the west.